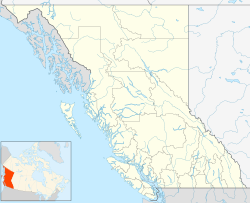 Fintry is a small community in British Columbia, Canada. It lies on the west shore of Okanagan Lake, 24 kilometres (15 mi) north of the city of Kelowna, and 50 kilometres (31 mi) south of Vernon. It has about 50 homes and is at the bottom of a three kilometre steep windy road off West Side Road. There are a few public beaches as well as a provincial campground. Shorts Creek, once known as the Elk River and Riviere a la Biche, is a medium sized stream that runs through the middle of the community. The creek is named after Captain Thomas Dolman Shorts, a ship captain for the Canadian Pacific Railway Lake and River Service steamboats on Okanagan Lake who was the first non-native to land at the creek and the surrounding area. Fintry Falls, accessed via a steep stairway, is located in a small canyon where Shorts Creek drops into the town toward the lake. ^ "Fintry". BC Geographical Names. ^ "Shorts Creek". BC Geographical Names. This page was last edited on 21 April 2018, at 03:26 (UTC).